Features advanced polyurethane filter construction for extra lightweight and durability. On average Simota air filters weight 39% less than the competition. Strong galvanized steel mesh with bright epoxy coating. 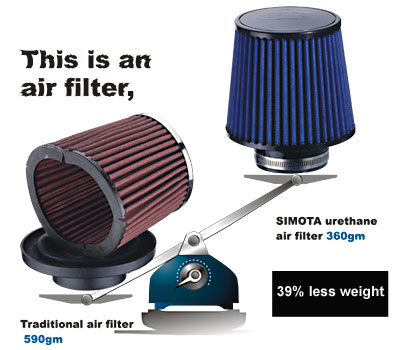 Simota's one -piece formed urethane construction ensure a safe and perfect airtight fit with the intake pipe.